While promotion Defying Gravity Mr. Big stopped in Milan and that show was recorded for a live album with an additional Blu Ray. Nobody knew at that time that it would be one of the last shows of drummer Pat Torpey who passed away early 2018 after battling Parkinson's Disease. At the tour he already played drums just one a few songs, but handled the tambourine and added backing vocals. Drummer Matt Starr took over on the other songs. So this live recording is a special one. As so many times in the past they kicked off with Daddy, Brother, Lover, Little Boy - a classic. Next in line American Beauty off What If, their 2010 release. As usual Eric Martin and his mates mix old and new songs, and with guys like Billy Sheehan and Paul Gilbert on strings it's no surprise that live these guys get a chance to shine even more. As usual Mr. Big isn't presenting the songs exactly as on disc, they take the chance to make little changes to make it interesting, but not to a point where the songs is completely changed! Their hit Addicted To That Rush they blow up to 10 minutes running time, so you can imagine that there are some solo passages and improvisation to discover. In the middle of the song Eric Martin takes to the fans about addictions and what's driving them for so many years. And towards the end Eric Martin introduces the band, even if everybody at the show will know these guys. Just take a look at the set list! It has all the classic and some new tunes. 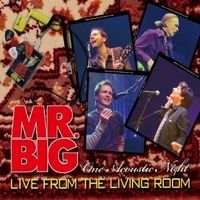 This album is a must-have for Mr. Big fans and everybody who loves their sound! So get your copy now! 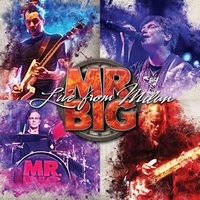 Mr. Big don't need to be introduced, they did 7 studio albums and even more live albums - some have been just released in Japan - and now they have another live album for their fans. You might wonder, why another live album... Well, this time it's an acoustic live album which make sense, coz they are best known for To Be With You, an acoustic track. The acoustic album was recorded in Japan during a promotion trip for What If..., so the majority of the songs is from that album. Still, it's a great album which every fan of acoustic rock, hard rock and Mr. Big should grab! Hopefully the awesome foursome will do a few acoustic shows next time they hit the road! Mr. Big is back with a studio album recorded by the original line-up, something their fans have been waiting for. What If... was produced by Kevin Shirley, so there is no need to talk about the production here. Most rock fans will know at least the bands smash hit To Be With You, but the band always had some rockers to offer. The opener is called Undertow, a heavy, riff-based rocker which they choose to be the first video. At Undertow guitarist Paul Gilbert shows off his skills, but not like some others with long solo passages! With American Beauty they offer a typical Mr Big rocker with a prominent bass line, varying drum patters, a cool guitar solo - and on top Eric Martin's unique vocals. This song could have been recorded for Lean Into It! Time to slow down for Stranger In My Life, a melancholy balladesque tune. A song like Nobody Takes The Blame won't be everybody's darling, it's a bit experimental... in a way. The fast rocker Still Ain't Enough For Me is another showcase of the guys technical skills, but also catchy. Sheehan's bass reminds me a bit of Addicted To That Rush - but I should listen to the later one again for confirmation. At As Far As I Can See Eric Martin can shine, he's still an outstanding singer. A ear catcher! But even if Eric Martin can showcase his talent, the others do to. One of my faves is I Won't Get In My Way, a mid-paced rocker with a catchy vocal line. Not too polished, but with great harmony vocals. After the fast rocker Around The World - with some big backings - they close the album with I Get The Feeling, a melodic rocker which brings back the 80's. Not really a highlight of What If..., but still a decent track! Unforgiven is the bonus track in Europe and the USA, a tune which gives Paul Gilbert another chance to show his talent. Perhaps not the song which make you pick up the album again, but there are others which will make you spin it again. 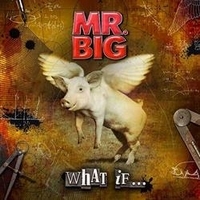 It's been 10 years since their last studio album, but with What If... Mr. Big  show that they are still alive and kickin'! Mr. Big were the super group of the late 80's and they took the hard rock scene by storm. They had several smash hits and toured successfully. In 1999 guitarist Paul Gilbert left the band and was replaced by Richie Kotzen, but in 2002 Mr. Big disbanded. The fans of the band extraordinary still loved the album and wanted them back. Early 2009 the band reunited and played some shows in Japan. This double CD - as well as the DVD - are documenting the return of the hard rock's Fab Four. As so many times before the band kicked off with Daddy, Brother, Lover, Little Boy (The Electric Drill Song), one of their classics. Actually the live album has all their classics - and more - to offer. Together the foursome creates something magic, the songs sound fresh and the band sounds like they enjoyed being back on stage.... Back To Budokan is what the fans were waiting for - the band back on the road and a live album which reflects their whole career. The sound is very good, but that's no surprise and also solo performances of Billy Sheehan, Paul Gilbert and Pat Torpey won't surprise any fan. Just that the solos are a bit too long... at least for me. And the backing vocals partly sound a bit strange, but hell it's a live album! The acoustic version of Wild World shows Eric Martin very expressive and it seems like he's singing this one for someone special... And again Mr. Big show that their songs can shine when reduced to the basics like the acoustic version of Goin' Where The Wind Blows. They mix rockers and ballads, so they rock the house with Colorado Bulldog after playing To Be With You. And with Deep Purple's Smoke On The Water they present one of the most covered songs. I Love You Japan was followed by Baba O'Riley (The Who), personally I prefer the original... With Shyboy the set ends, but not the CD! Additionally the band added 2 new studio tracks and an acoustic version of To Be With You. The first new track is Next Time Around, a melodic rocker which has the authentic Mr. Big sound - and won't disappoint their fans! With Hold You Head Up the foursome try something new, but they don't push it too far. Even if this one won't make every Mr. Big fan happy... 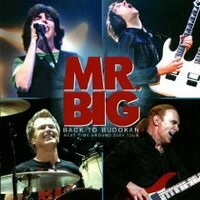 If Mr. Big are fully back will only a new studio album show, meanwhile you can have a great time with Back To Budokan.